One of the fun jobs in the run-up to Christmas is icing the Christmas cake. You don’t have to be a professional cake decorator to know how to do this; it is quite easy to produce a lovely cake to take center stage on the tea table. You can buy ready-made marzipan and/or fondant icing, brightly colored ribbons, leaf cut-outs, or a sprig of holly to make a cake to be proud of. If you have the time and the inclination, however, then make your own icing. It doesn't take long and is fun to do. 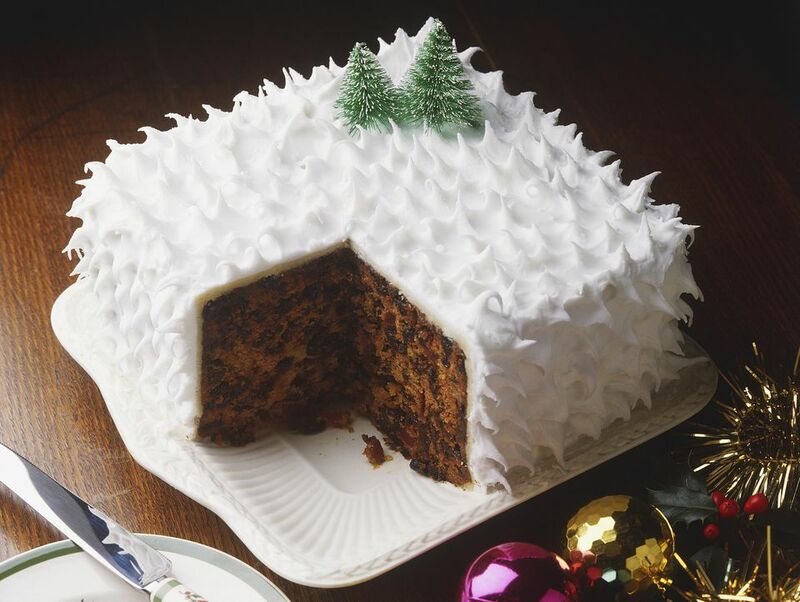 Don't leave Christmas cake icing until the last minute. It needs to be finished at the latest a week before Christmas, preferably two weeks before. Before any icing takes place, you will need to cover the cake with a thick layer of marzipan/ almond paste. As well as giving a lovely almond flavor to the cake, the thick paste layer creates a cushion between the cake and the icing. It is important once the marzipan is on the cake that you let it dry for a few days or up to one week before icing. If you ice too soon, the oil from the almond paste will seep into the icing and spoil the appearance of the finished cake. Stand the cake on a cake board or cutting board and lightly dust with sifted confectioners' sugar. Roll 2 1/2 pounds/1.25 kg marzipan/almond paste evenly into a circle large enough to cover the top and sides of the cake. Paint all surfaces of the cake to be covered with 4 tablespoons of strained warmed apricot jam. Slip the circle of paste onto the cake and pat carefully all over the surface to make sure it is attached to the cake. Check that the surface is smooth and even and trim away any excess. Let dry in a cool, but not cold, place uncovered for a few days or up to one week. Traditionally, glossy royal icing would be used to cover a Christmas cake, but unless you are a skilled decorator, it can be tricky to use unless all you want is to make a “snow” effect on the surface, then this is the best icing to use. Make the royal icing recipe icing and then spread it over the almond paste-covered cake with a flat palette knife in a smooth layer or swirled to make little peaks all over the cake. Decorate as you wish with silver or gold sugar balls, Christmas ornaments, whatever takes your fancy. Let the cake dry until the icing sets hard (at least overnight or up to three days) before serving. If not serving immediately, store in an airtight tin. Instead of using royal icing, the cake can be iced with rolled fondant, which is a quick-and-easy way to create a smooth iced surface for your cake. You can use it alone, or with the marzipan layer and even finish with a splash of royal icing if you are feeling a little decadent. Fondant icing is also useful for cut out shapes to decorate the surface of the cake. Make the rolled fondant, cover the bowl and let it rest for 20 minutes. Dust your work surface with confectioners' sugar and evenly roll the dough into a smooth circle large enough to cover the cake. Brush a little beaten egg white over the almond paste surface of the cake. Lay the fondant over and gently pat into place. Trim away any excess. Finish by using scraps of fondant to create cut-out shapes (leaves, stars, hearts, the choices are endless) and stick them on using egg white for glue. For different-colored shapes, take a small piece of fondant icing, roll it into a ball and flatten on the work surface. Place one tiny drop of food coloring on the surface. Roll the icing back into a ball and knead to create an even color throughout. If you like, tie a large red ribbon around the outside and stick a sprig of holly on top. Let the icing set hard (at least overnight or up to three days) before serving. If not serving immediately, store in an airtight tin.